Waxed Media is proud to be involved directly with Waxed Sport. The directors of Waxed Sport Management have created the business with a long-term vision to assist young talented sports men and women to both maximise and reach their full potential. In order to achieve this purpose the directors have undertaken to make available to young athletes a full bouquet of services ranging from contractual negotiations, opportunity creation, individual mentorship, financial advice and assistance with our partners in the relevant industry as well as individual bespoke training and coaching regimes. 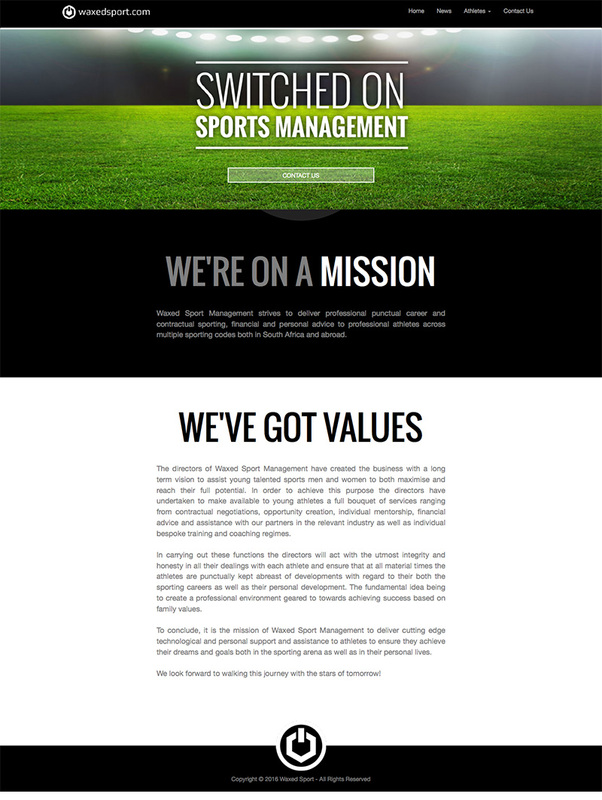 It is the mission of Waxed Sport Management to deliver cutting edge technological and personal support and assistance to athletes to ensure they achieve their dreams and goals both in the sporting arena as well as in their personal lives. Waxed Media did a great job in implementing and integratating Waxed Media with Waxed Sport. We are proud associates and are happy with the website designed, the graphics and logo, and of course the Social Media Marketing. The Waxed Sport website is a custom build and allows us to upload hundreds of athletes to the site easily. Here's to the way forward! Thanks Waxed Media.